The return of the water has created new prospects facing the two canals, a new profile of the city is revealed to the eyes of those who arrive in Piazza XXIV Maggio. They will return the barges that travel the canals, and it has been also remade the pier at the beginning of the great waterway . Reopens after decades also Ticinello, the drainage canal of the dock, which brings excess water to the creek Vettabbia, Ripamonti area: the first stretch of the canal passes under Porta Ticinese. Now the basin will become a zone of transition: from the new municipal market you will come to the bridge just built to connect via Gorizia in Viale D'Annunzio, and along the way there will be benches and a bar. Sunday, April 26 Milano will celebrate the milestone with a big party, live music, street performers and they will be present the associations and traders in the area. 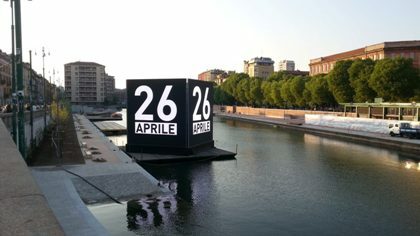 To commemorate the "historic" event there is a 26 light towers on the dock for a few days ... this is The Cube, a cube led to 8 meters per side, a touch point that for every six months of the Expo will broadcast video of institutional Expo 2015 and the institutions, editorial content provided by canals Lombard, useful for citizens and tourists. If you will be in the area in the evening and you will be looking for a restaurant in Milan, for those who want to taste the Milanese tradition we suggest eating at The meatball Family in via Vigevano, branded with the hand and the face of the Italian actor Abbatantuono, a friendly and welcoming place where you can taste meatballs in all ways. Cheers to the new dock also by Ideaweekend!